Luxury in your bathrooms is not just about aromas of candles, soft piped music and the flowers welcoming you or the stark wrap of marble and Spanish tiles . Theres more to it . The bathroom fixture industry has made sure you sense luxury in every element from the design and styling of the fixtures to technology integrated into them to make sure you don’t miss out on pampering your self during a relaxed shower . Before you set off to design the bathroom make sure you have defined your requirements wether it’s the rain shower which excites you or a body shower or body jet each have their own nuances of experience . You may want to either create a mix of fixtures to customize your own shower panel system or look out for integrated system . Customization not only gives you an edge over picking up the best of the world but also gets built into your wall not bringing in too much focus on the fixture itself but allowing the canvas to show through . An integrated system would be recommended only if the design of the system is so sleek and styled that it adds in value by its mere presence to the décor. While placing any of the fixtures its very important to understand the users ergonomics to deliver personal comfort zone rather than simply going by the average data. A few systems like a mechanical controller thermostatic controller , digital controller that you must be aware before you explore searching for the fixture. A mechanical controller allows you to mix the water temperature by an approximate judgement, a thermostatic controller will allow you to mechanically control the water temperature to preferred set presets and the last every technology geek would love to indulge in is the world of digitization where at a finger touch you can choose multiple options , set in personalized temperature level and even create a menu for multiple users. The size of the rain shower may also interest you, one can select a size just comfortable for a single user to making it more romantic by picking up the larger ones sufficient to spray a couple. You even get a dual system indulging ding a cascade flow for that feeling that you are just under a waterfall. 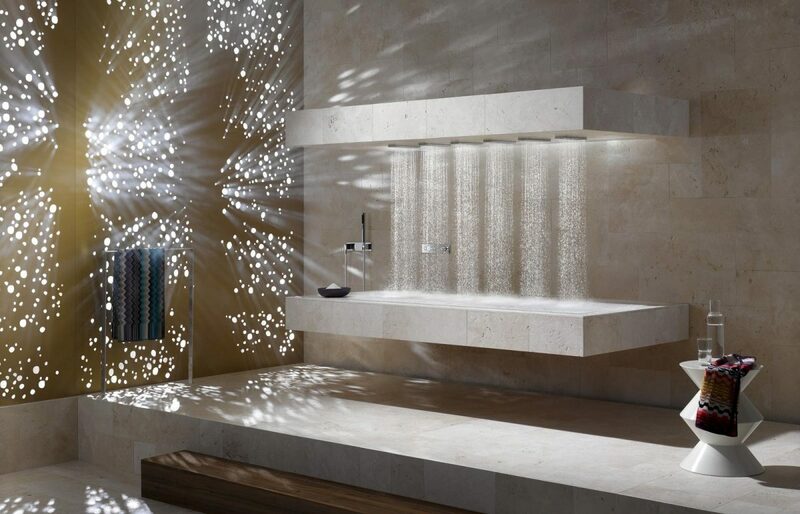 For a 360 spray experience you can use the water tile option which would allow the water to be sprayed form multiple sides and angles creating a totally indulgent experience of shower. Apart from preferences make sure you get it all technically sound back the sytems by pressure pumps to enjoy the right flow and water pressure. Also depending on the no of systems you have picked up specially if you are using a mechanical or thermostatic controller make sure with your supplier if you may need two controllers to allow you flexibility of use you can also opt for 5 way controllers which give you a larger choice of options and controls in a single unit . A few brands you may look for are gessi, fantini , joerger, grohe .